For the fish, cut 2 pieces of felt for each fish. Place paper clip between the two fish, with about a half inch sticking out where the fish's mouth would be. Stitch in a straight line looping around the paper clip to hold it in place. I used a sewing machine at first but after 1 bent needle and 2 broken ones I decided to just do it by hand. Glue the rest of the halves of the fish together. Use the fishing rod to catch the fish. The magnet will attach to the paper clip. Practice naming colors as you catch each fish. You have to slowly pull the rod up when the magnet attaches to the paper clip, otherwise the fish will fall off. 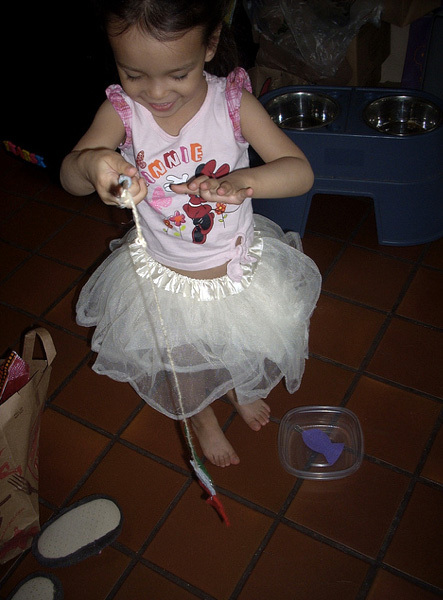 Leah, 2.5 years old, sometimes uses her hands to attach a fish (or even 2) to the magnet. She has used the rod to catch fish the proper way before, though.